We are located in on the corner of West Poplar St. and North West Ave in Downtown Sidney, Ohio. 127 W. Poplar St. Sidney, Ohio 45365. Our goal, create a landmark restaurant that provides a quality dining experience in the heart of Shelby County. Focus on high quality food using premium ingredients, a level of service that meets customer expectations and a fine dining experience in a casual and relaxed manner perfect for all occasions. The Bridge Restaurant was created by Kent Wolters and members of the staff. Kent's interest in history, historic landmarks and developing a close connection with the community made creating the name a pinnacle for our vision. Connecting Kent’s interest with the restaurant’s name and theme was the challenge. 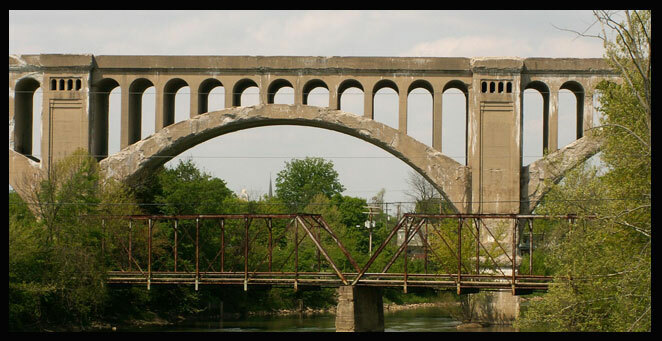 After many possibilities, it was apparent the Big Four Bridge is a historic landmark that played a significant role in Sidney’s economic stability during a time of need in the early 1900’s and years following. It was unmistakable the name of the restaurant would be tied to the Big Four Bridge. Providing a quality dining experience is our commitment. A paramount restaurant in Shelby County will aid further development of Sidney’s downtown area and the community. Enjoy.